Chippewa is such a great work footwear company. And their Chippewa Men's 73051 Black 8 Inch Waterproof Insulated Logger Work Boots are a real beauty. Featuring a classic logger style, these waterproof boots mean business. These Chippewa boots are made with blac ... (see full details) (see specifications) #CHP73051. 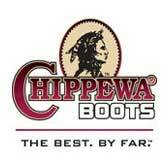 Chippewa is such a great work footwear company. And their Chippewa Men's 73051 Black 8 Inch Waterproof Insulated Logger Work Boots are a real beauty. Featuring a classic logger style, these waterproof boots mean business. These Chippewa boots are made with black oiled leather uppers, and are lined with brushed Ruby nylex for comfort. They're insulated with 400 grams of 3M Thinsulate Ultra insulation for extra warmth, and they have removable Texon orthotic footbeds that are very comfortable on your feet. Through the wind and the freezing temperatures, you can rely on these cozy materials to keep your feet warm. The men's boots are made with Goodyear leather Welt and Chip-A-Tex waterproof construction, which means that the uppers are sewn directly to the oil- and slip-resistant Vibram Tacoma logger yellow plug outsoles that are made as a one-piece unit. Since Goodyear Welt construction is used to make this Chippewa footwear, you can (eventually, if needed), have the rugged outsoles replaced if the leather uppers remain sound. This increases the life of them, which is definitely a great added feature for you! The black boots also feature non-tarnishable antique brass hardware on their exteriors, as well as heavy duty wax Sta-tied laces. Your feet will be secure inside, and once they are, they'll receive excellent support from the steel shanks and 4 iron rubber/6 iron robus combination midsoles. These help stabilize your feet while supporting your arches, too. This paired with slip-resistant tread should help you stay upright! Chippewa Men's 73051 Waterproof 8 Inch Black Insulated Logger Boots offer treads that are sure to give you the traction you need no matter where you are working. Originally intended for loggers who are in the woods cutting damp trees covered with moss and underbrush, these insulated boots will keep your feet warm and dry in the dankest and darkest of places. Stay warm out there! These features are also available in the 73050 (Women's L73050) with the added benefits of Thinsulate Insulation and a safety toe. Take a look! Chippewa Boots: Men's 73051 Black Waterproof Insulated Logger Boots is being added to your cart.